Sam Bailey for Lancaster City FC. Picture: Tony North. 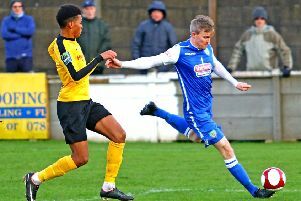 Lancaster City recorded back to back wins and a return to form with a well-earned victory over Marine on Tuesday night with goals from Craig Carney and a brace from the ever-impressive Sam Bailey. The visitors, managed by former Dolly defender Tony Sullivan, were the makers of their own downfall at times but Phil Brown’s side showed signs of returning to their best with some slick attacking moves. Another former face in Martin Fearon, the highly rated City stopper of many years, gifted Lancaster the first goal after just eight minutes. His goal kick was scuffed straight to the feet of Craig Carney for a free run at goal, rounding the keeper and slotting home to break the deadlock. City had chances to double the lead in the action that followed, but none of Carney, Bailey, or Melle Meulensteen’s efforts hit the target. At the other end Josh Powell continued his fine form with another super save to deny Michael Grogan from close range in a rare chance for the visitors. Meulensteen was then unlucky not to get on the scoresheet, his rasping effort from 25 yards striking the bar in the closing stages of the first half. There were half time changes on both sides, with Marine making a double attacking change whilst Carney and Tom Kilifin were withdrawn due to injuries for Oliver Wood and Billy Akrigg. With City’s rhythm unsettled Marine had a decent spell of pressure in the early second half exchanges but couldn’t get the better of a resolute Dollies’ defence. Sam Hibbert then turned the balance of play around with a superb solo run, carrying the ball over 60 yards past nearly the entire Marine line-up before being up-ended in the box for a stonewall penalty. Bailey stepped up and leathered the ball into the left hand corner from the spot to double City’s advantage and scored his second just three minutes later. A flowing attacking move culminated in a one-two between Bailey and Harries setting the midfield man behind the Marine back-line. The deft finish that followed, low past Fearon into the bottom right corner, settled the match and gave the Dolly Blues real breathing space with 20 minutes to go. Bailey’s hat-trick was almost complete after Akrigg’s cross picked out the winger in space just inside the box with ten minutes to go but his shot rattled the bar as City were again denied by the woodwork. In the City goal, Powell produced another super save to deny Danny Mitchley late-on after the forward was picked out with a lovely through ball, but there was to be no way past the Dollies’ no.1 on the night. Man of the Match: Josh Powell.